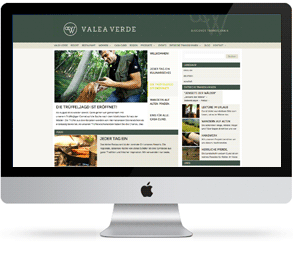 Valea Verde Resort is a family business in Transylvania. The task was to position Valea Verde in a touristically less developed area such that visitors would especially choose this particular resort as an ideal base for their exciting, exploratory journey through Transylvania. DISCOVER TRANSYLVANIA. TOTAL: Positioning, strategy, conception and implementation. GPAPHIC DESIGN: Logo, branding, business equipment, folder with template creation of the module-like structured layouts for in-house software upgrades. PRODUCT DESIGN: Wine labels and product labels.